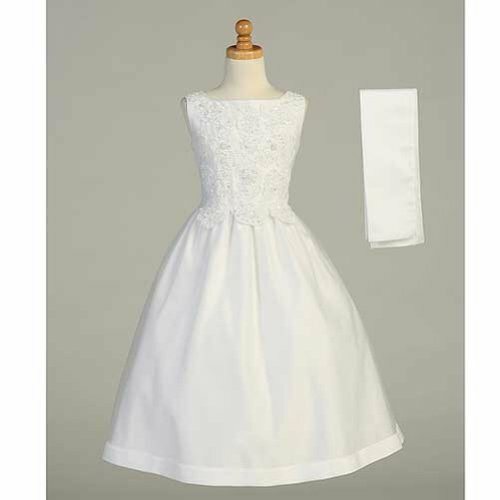 Lito White Beaded Tea Length First Communion Dress Shawl Girls 16.5 | What Should I Say? Lito White Beaded Tea Length First Communion Dress Shawl Girls 16.5 by Lito at What Should I Say?. MPN: CALITO-SP91716.5. Hurry! Limited time offer. Offer valid only while supplies last. This dress and shawl set is perfect for her First Communion from Lito. The tea length dress has a beaded applique satin bodice with beaded neckline. This dress and shawl set is perfect for her First Communion from Lito. The tea length dress has a beaded applique satin bodice with beaded neckline. The sash ties in the back and this dress zips in back. The tulle skirt has an attached underskirt for added fullness. Shawl completes this beautiful look.